A painting of heightened psychological intensity, Pablo Picasso’s Femme au béret et à la robe quadrillée (Marie-Thérèse Walter) brings to a climax a turbulent and highly charged year. The great masterpiece of his career Guernica was created in 1937, and in the final month of that momentous year he painted this vivid, poignant and intense image of his golden muse Marie-Thérèse Walter. 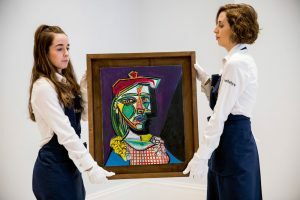 This defining work will be offered for the first time as a star lot of Sotheby’s Impressionist & Modern Art Evening Sale in London on 28 February 2018. The women of Picasso’s life are the fulcrum of his creative genius, unquestionably essential to his creative and intellectual processes. Femme au béret et à la robe quadrillée (Marie-Thérèse Walter) charts Picasso’s evolving relationship with his muse Marie-Thérèse Walter, to whom he was ostensibly still devoted at the time, and the increasingly dominant presence of his new lover Dora Maar. Indeed, the work appears to have been used as a means for exploring his feelings for the two women. There is a conscious blurring of the two styles inspired by the two muses, reaching its pinnacle in the silhouetted ‘other’ that emerges from behind the main subject. Whether it represents Maar or indeed a self-portrait, the implication is that of duality and conflict. Picasso is quoted: ‘It must be painful for a girl to see in a painting that she is on the way out’. The beginning of the decade marked a period of sublime happiness for Picasso, as witnessed in the extraordinarily sensual and lyrical paintings of Marie-Thérèse in 1932 – which are the subject of the current acclaimed exhibition at Musée Picasso in Paris and will feature in a forthcoming show at Tate Modern in London. This extremely dynamic painting reveals just how much things had changed for him in the intervening five years. The work’s sharp cubistic edges, thick impastoed paint and black outlines give it an immediate visual impact – the emphatic execution and bold palette packed with emotional charge. The depiction of Marie-Thérèse has matured from the voluptuous curves and sleepy, passive suggestiveness to the woman who gave birth to Picasso’s child. The portrait suggests that she continued to be of central importance to the artist. 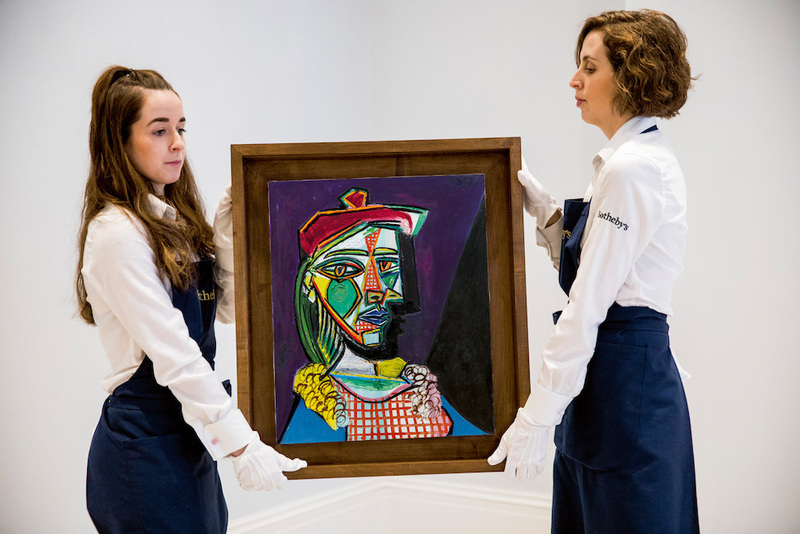 Tagged art auction, Picasso, Sotheby's.